This is a great little RFID Reader Module from Innovations, similar to the ID models (the difference being no silicone protection on the back). If you need an inexpensive way to get started with RFID, this is a great little module. Just power the module, and it will read any RFID card within range. It will output the cards ID in a serial string, which can easily be read by any microcontroller. The spacing on the pins is 2.54 mm, which means the module will directly fit on a breadboard. 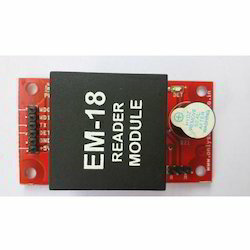 T he EM-18 RFID Reader module operating at 125kHz is an inexpensive solution for your RFID based application. 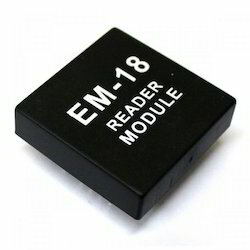 The Reader module comes with an on-chip antenna and can be powered up with a 5V power supply. Power-up the module and connect the transmit pin of the module to recieve pin of your microcontroller. Show your card within the reading distance and the card number is thrown at the output. Optionally the module can be configured for also a weigand output. MF RC522 is applied to 13.56MHz contactless communication highly integrated chip card reader, is NXP for the "Three Tables" application launch of a low-voltage, low-cost, small size and non-contact card reader chip, smart instrumentation and portable handheld devices developed better choice. MF RC522 using advanced modulation and demodulation concept completely integrated in all types of 13.56MHz passive contactless communication methods and protocols. Support 14443A compatible transponder signals. The digital part handles ISO14443A framing and error detection. In addition, support fast CRYPTO1 encryption algorithms, terminology validation MIFARE products. MFRC522 supports MIFARE Series higher speed non-contact communication, two-way data transfer rates up to 424kbit / s. As a highly integrated 13.56MHz card reader new family of chips, MF RC522 MF RC500 and MF RC530 and there are many similarities, but also have many features and differences. It is between the host communication using SPI mode, helps to reduce connection, reduce PCB board size and cost. MF522-AN module adopts Philips MFRC522 original reader circuit chip design, easy to use, low cost, suitable for equipment development, development of advanced applications such reader users, the need for RF card terminal design / production of the user. This module can be loaded directly into a variety of readers molds. Module uses voltage of 3.3V, through the SPI interface simple few lines can be directly connected to the user any CPU board communication module can guarantee stable and reliable work, reader distance. This is a great little RFID Reader Module from Innovations, similar to the ID models (the difference being no silicone protection on the back). If you need an inexpensive way to get started with RFID, this is a great little module. Just power the module, and it will read any RFID card within range. It will output the cards ID in a serial string, which can easily be read by any microcontroller or PC with RS-232 interface. The spacing on the pins is 2.54 mm, which means the module will directly fit on a breadboard. 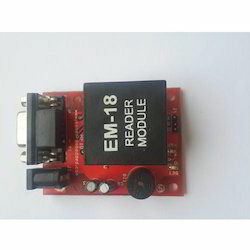 T he EM-18 RFID Reader module operating at 125kHz is an inexpensive solution for your RFID based application. The Reader module comes with an on-chip antenna and can be powered up with a 5V power supply. 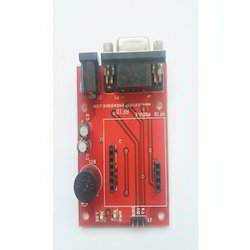 Power-up the module and connect the RS-232 transmit pin of the module to receive pin of your microcontroller using MAX232 converter. Show your card within the reading distance and the card number is thrown at the output. Optionally the module can be configured for also a weigand output. A popular way to transfer commands and data between a personal computer and a microcontroller is the use of standard interface, like the one described by protocols RS232 (older) or USB (newer). This chapter is devoted to communication conforming to RS232 protocol, the hardware for such interface is provided on board. An example will be presented showing the processing of commands received through RS232 interface, and sending of a string of numbers using the same interface. Leveraging on our extensive industrial experience, we are counted among the most eminent suppliers and traders of a technically advanced array of RFID Reader & Card. 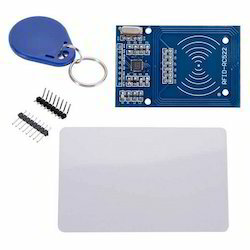 Under this category we offer RFID Reader , RFID Reader - Serial Out, RFID Reader - Serial Out, RFID Reader - USB, RFID Reader & Writer 13.56MHz - Uart Interface, RFID Clamshell Card/TAG 125kHz, RFID Tag Keyfob (125kHz), MIfare Classic 1k Card 13.56MHz for meeting varied application needs of the customers. All these products work on the modular technology and are highly capable of processing secret tags & codes in readable data. This RFID Reader Module 125Khz is eary to use. It is Low Cost. It gives Serial and Wiegand26 Output. Using the board with microcontrollers to read a card's data is very simple and requires just a serial connection. The board should be powered at 5V, and it requires a direct connection to the microcontroller's Serial(Rx) pin. The card data is transmitted over the serial line when the card is brought near the module. The board has an onboard power indication LED, a LED and Buzzer to indicate the presence of a RFID Card. All the IO pins are brought out to standard clearly labeled header pins, which reduce prototyping time and effort. An output pin (DET) also indicates the presence of a RFID card. The board can also be used to output data in Wiegand format. It can detect cards in the range of 3-8cms. µRFID Reader used to read our RFID cards. Using the module with microcontrollers to read a card’s data is very simple and required just a serial connection. The module should be powered at 3.3 – 5.5 VDC, and it requires a direct connection to the microcontroller’s Serial Rx pin. The card data is transmitted over the serial line when the card is brought near the module. RFID is Radio Frequency Identification. An RFID reader is used to read RFID tags (which contain certain unique data stored in a chip). An RFID reader and an RFID tag, both have a coil surrounding them. When an RFID tag is shown near an RFID Reader, it collects the unique tag data (a combination of digits and characters) from the RFID tag. Power the μRFID reader; when an RFID tag is shown near the reader, electromagnetic induction will take place between the coils and this powers the chip inside tag. This chip will send data electromagnetically to the reader. The reader will receive this electromagnetically transferred data and outputs it serially. Every RFID reader comes with Serial output pins. We can collect the read data through these serial pins using arduino. Are you still looking for the RFID ID card keyfobs for Door Access Control use. 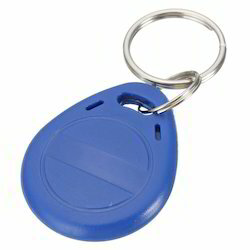 There are 100pcs Blue colour 125Khz RFID proximity ID card keyfobs, with high-quality and can meet your need perfect. This board is based on the EM18 RFID Module. Using the board with microcontrollers to read a card's data is very simple and requires just a serial connection. The board should be powered at 5V, and it requires a direct connection to the microcontroller's Serial(Rx) pin. The card data is transmitted over the serial line when the card is brought near the module. The board has an onboard power indication LED, a LED and Buzzer to indicate the presence of a RFID Card. All the IO pins are brought out to standard clearly labeled header pins, which reduce prototyping time and effort. An output pin (DET) also indicates the presence of a RFID card. The board can also be used to output data in Wiegand format. It can detect cards in the range of 3-8cms. This is a great little RFID Reader Module from Innovations, simillar to the ID models (the difference being no silicone protection on the back). If you need an inexpensive way to get started with RFID, this is a great little module. Just power the module, and it will read any RFID card within range. It will output the cards ID in a serial string, which can easily be read by any microcontroller. The spacing on the pins is 2.54 mm, which means the module will directly fit on a breadboard. Looking for RFID Smart Card ?